Mascarpone is a creamy Italian sweet cheese that is an ingredient in tiramisu. 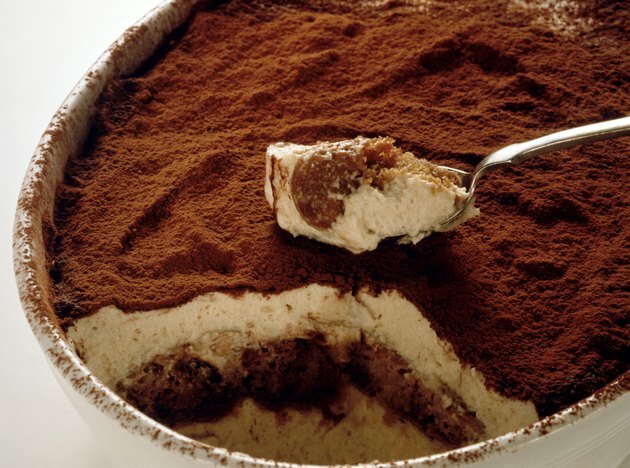 While there are no 1-to-1 substitutions that give the precise taste and texture to your tiramisu that mascarpone does, you can substitute whipped heavy cream, cream cheese or a combination of the two. No matter which option you use, the recipe will taste slightly different; you might have to tweak these recipes to find something that suits your taste. Whip heavy cream to stiff peaks, and substitute 1 c for each 1 c of mascarpone. Beat cream cheese until it is fluffy, and substitute 1 c for each 1 c of mascarpone. Beat ½ cup of cream cheese with ¼ cup of heavy cream and 2/3 cup of confectioner's sugar until it is smooth and fluffy. Again, substitute the mixture in a 1-to-1 ratio for mascarpone. If you prefer a very sweet dessert, use the sweetened cream cheese and heavy cream combination. If you prefer a less-sweet, fluffy dessert, use whipped heavy cream. If you prefer a less-sweet but more substantially textured dessert, use beaten cream cheese.